Designer Henry Walter (H.W.) Klein was born in Norway in 1919.In 1949, he moved to Denmark to study interior design at the Tekniske Skile in Frederikberg. 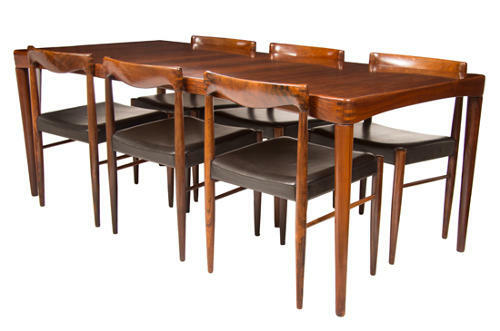 There, he trained under the prominent Danish designer and architect Finn Juhl.His chairs, tables, and sideboards are characteristic of the postwar Danish modern style, typically involving fine woods like teak and well proportioned, well crafted forms.In 1960, Klein and his family moved to Denmark so he could work full time at Bramin. This is a rare and absolutely superb quality example in rosewood.